L 23″ (58 cm). Sexes similar. 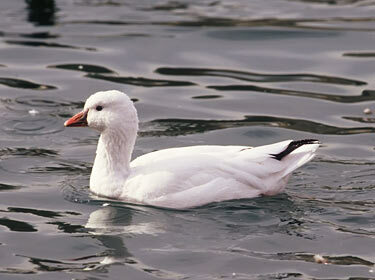 Similar to high-pitched bark of a small dog; similar to that of Snow Goose, but higher. Description: Two distinct color phases, “white” and “blue”. White-phase adult all white with black wing tips; stubby, pink bill, lacking black “grin patch”. Immature white-phase may have grayish wash on head, back, and flanks. 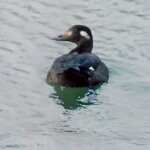 Extremely rare blue-phase has mostly white head and belly, brown back; black primaries and secondaries, wing coverts bluish-gray. 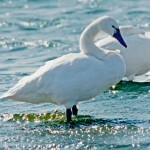 Habitat: Marshes, sloughs, riverbottom meadows and croplands. Lakes or reservoirs near croplands are also used. 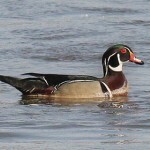 Where in Nebraska: Fairly common regular spring migrant across the state. An uncommon regular fall migrant in central and eastern Nebraska, and a rare casual fall migrant in the west. Field Notes: Small flocks of Ross’s Geese often associated with Snow Geese.